This UI looks very nice. I have been working on a UI for my own game as well. May I ask how you load your objects? I don't have an editor yet and putting everything together in code leads to ugly mile long functions. That's why I turned to XAML to load (or save) my layouts. That works so well that I also based the UI theme and even complete scenes for the 3D engine on XAML scripts embedded into the assembly. Thanks Unfortunately no, GeonBit.UI don't support XAML atm. If you happen to write something like this (XAML for GeonBit.UI) let me know I'd love to integrate it. I'm quite busy with my own UI, but what if I tell you that you only need to add about 10 lines of code in two static functions. That's all. One function can load any valid XAML, the other one takes any serializable object and serializes it to XAML. You can use the second one to generate your first XAML files from the objects you have initialized the conventional way up to now. After that you can throw this code away and just load your objects from this XAML. The code I posted there works for files. That's not practical. Change the loading method to use embedded resources and embed those XAML files into your assembly. You can't save to an embedded resource, but that's ok. You only need the save method as a crutch to get the first XAML files. I've updated to the newest version (2.0.1) and the installation went fine with NuGet. 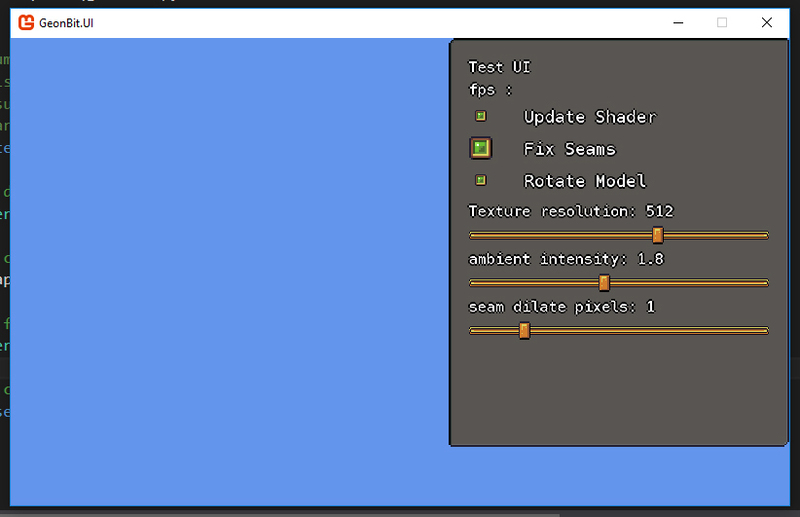 I only had to change some stuff like UserInterface now being global, SCALE to GlobalScaleetc. and it ran with no problems. I think some scale stuff is now handled differently, some buttons are now smaller than others, but I haven't looked into why yet. Also some text now "runs away" at the beginning, but I'm sure that's a mistake on my part (both things). Either way, I think it's easy to use and works fine. One little thing: You use enum for almost everything, but when using UserInterface.Initialize(... theme) there is still a string (default "hd"), but without enums it's hard to know what other themes there are if not looking at the documentation. Also the shader files for HD and lowres are the same, maybe only having them once might prevent future bugs and save a little space and compilation time. However, even though I can't look at the files themselves, since they are "hidden" behind the compiled .dll now by default, i have huge troubles with garbage generation. I have merely 3 buttons and 3 sliders, but the garbage generated is enormous, and that's mainly due to using strings to read out configurations. The last time I checked there was a lot of enums being stringed together and you then compare the string values and look for certain parts to continue. If that is still the case, and performance profiling suggests it is (most garbage is created somewhere in GetStyleProperty), you could look into encoding these enum combinations differently, maybe in a struct or mini-class that combines several input parameters. Since enums are essentially ints you could also use some decimal or bit encoding / decoding. Could you elaborate more on the running text thing? Like, the text starts at wrong position and "jump" to its right place on first frame? If so with which entities? (had this problem in the past I though it was solved). Also the sizing is a little odd, I did change the default themes font which might change texts a little, but not buttons.. strange. It was to allow adding new themes without changing the code, eg you can create your own folder of theme and just use it by name. However, point taken, maybe I'll add a const for the two built-in themes or an enum and have function override. That's absolutely true, but I wanted to leave more freedom to custom themes. For example, maybe a theme where disabled entities are not greyed out but have different effect. I did found a serious memory leak with render targets which I just solved, but you're not using them right? There were other things as well last time we talked about it, most of them are solved. I added optimization against enums.toString() and some other places, but I have to admit I see no serious impact. Can you elaborate more on your suggestion with the int encoding? Do you mean using a 2d array with indexes or something different? Thanks for the useful (as always ) feedback! I will soon release a minor update that address some of the issues above, although I'm concerned that I didn't see the GC madness you mentioned.. I do nothing else with the UI. I commented out the text updates to make sure they are not part of the garbage. All my toggles run away. Some buttons are larger than others, because I change their scale, I think previously it only changed text scale, so that is a mistake on me then. Oh wow when you said running text you actually meant running text Never seen it happen before its so strange.. And I use a lot of checkboxes. Thank you for the info, I'll take a look at it as soon as I'll have the time (I'm at work atm) and hopefully will figure out the source of this checkbox shenanigans. uldn't reproduce the running away paragraphs. // This program show GeonBit.UI examples and usage. // game engine in MonoGame) and is free to use under the MIT license. // Or exaplore the different README files scattered in the solution directory. /// GeonBit.UI.Example is just an example code. Everything here is not a part of the GeonBit.UI framework, but merely an example of how to use it. /// This is the main 'Game' instance for your game. /// Create the game instance. /// Initialize the main application. /// Create the top bar with next / prev buttons etc, and init all UI example panels. /// Show next UI example. /// Show previous UI example. /// needed (if first or last example). Is your code public perhaps, somewhere I can view it? Or maybe you got more ideas I can try? can you reproduce the garbage generation? nope.. only what I showed in previous post (garbage collection every ~15 seconds and looks pretty flat.